eKartingNews.com, the Official Media Partner of Superkarts! USA, is proud to present the Preview Series for the SKUSA SuperNationals 21. Leading up to on-track action of the 21st edition of the marquee SKUSA event, EKN will preview each of the 10 categories that will compete outside the Las Vegas Convention Center and Westgate Las Vegas Resort & Casino from November 15-19. The 2016 SKUSA SuperNationals came down to a wild finish in the X30 Junior category as a light sprinkle of rain covered the Las Vegas Convention Center parking lot. The changing conditions sent some drivers off into the barriers, while those who found a way to tip-toe around the damp circuit were able to capitalize and secure podium finishes. In the end, Florida’s Tyler Gonzalez came away with the victory in his first Junior start at the SuperNationals. Coming off that victory, the SRC / Tony Kart driver took 2017 by storm, earning a FWT championship to start before scoring the US Rotax Grand Nationals victory, and challenging for the SKUSA Pro Tour championship with one win. In the eight previous attempts, no X30 Junior / TaG Junior driver has been able to repeat as SuperNationals winner. Breaking that streak will be the goal for Gonzalez. In addition to Gonzalez, the next or equal favorite has to be 2017 SKUSA Pro Tour champion Dylan Tavella. Three victories in the first five rounds helped to clinch the title for the IRM / Tony Kart driver. SuperNationals 21 is said to be the final kart race for the New Yorker, who is moving up to the F4 US Championship Powered by Honda in 2018. After receiving the press release making the announcement regarding his move to cars, EKN was able to contact Dylan’s father and learn of their plans to compete at the SuperNationals. 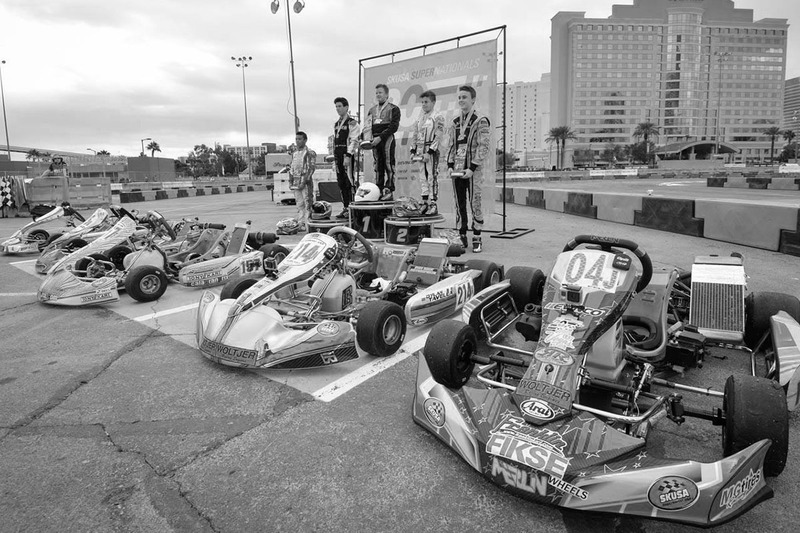 A favorite multiple times in the Cadet ranks without a win, it would be a fitting closure to his tenure in karting to end with victory in Vegas, coming one spot short last year to Gonzalez. Three of last year’s podium finishers will be in contention this year. California driver Oliver Calvo (PKS / Top Kart) finished fifth last year after the wild last lap. Nothing unusual to Calvo, who was one corner away from winning the TaG Cadet main event in 2015. 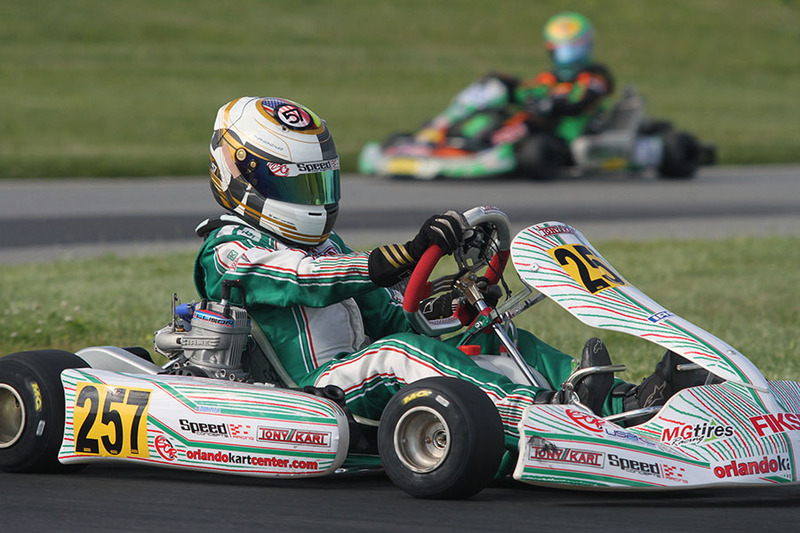 Calvo is coming off a second-straight victory at the Streets of Lancaster Grand Prix, and earning some grassroots knowledge with the Junior title at the KPX Karting Championship. 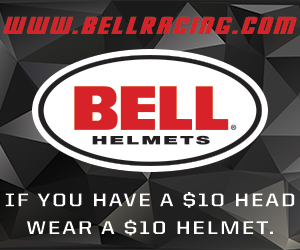 Let us not forget those who showed well throughout the 2017 season at the SKUSA Pro Tour. It was one of the most competitive seasons despite Tavella coming away with the title rather easily. Junior rookie Jak Crawford and veteran Trey Brown finished second and third to Tavella, and will carry the SKUSA plates at the SuperNationals. Crawford went winless during his rookie campaign, however, he stood on the podium four times in the six main events. Heading of the SuperNationals, he joins Team USA in Portugal at the Rotax Grand Finals before travelling to Vegas. 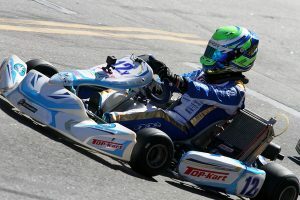 Brown ended the 2017 SKUSA Pro Tour with a victory, and claimed his second career California ProKart Challenge title, his first in Junior. You can bet the Nash Motorsportz / FA Kart teammates will be working together with a goal of standing on the podium on SuperSunday. One spot away from that podium last year was Arizona’s Jagger Jones (Tony Kart). The third generation driver has spent time away from karting in 2017 racing stock cars, and will be making a return for the SuperNationals, joined by his brother Jace, who will make his first Junior start in Vegas. A number of quality drivers are set to make their first Junior start at the SuperNationals. Last year’s Mini Swift winner Thomas Nepveu (PSL / Birel ART) is among the top rookies. The Canadian had a tough rookie campaign on the SKUSA Pro Tour, and will be looking to bounce back in Vegas. Standing with him on the Mini podium a year ago was Luca Mars and Tyler Maxson. Mars (Energy) began the season in Mini, sweeping the WinterNationals before stepping away to focus on the move to Junior, racing at the local and regional level. Maxson – the 2016 SKUSA Pro Tour Mini Swift champion – has had a great rookie season, winning at the USPKS, standing on the podium at the SummerNationals, and improving with each race. In late breaking news, Maxson has joined CRG Nordam for Las Vegas with plans to compete with the factory team in Europe for 2018, making his debut aboard the CRG at the SuperNationals. It is great to see Barbados driver Zane Maloney (SCR / Tony Kart) return to the United States and the SuperNationals. 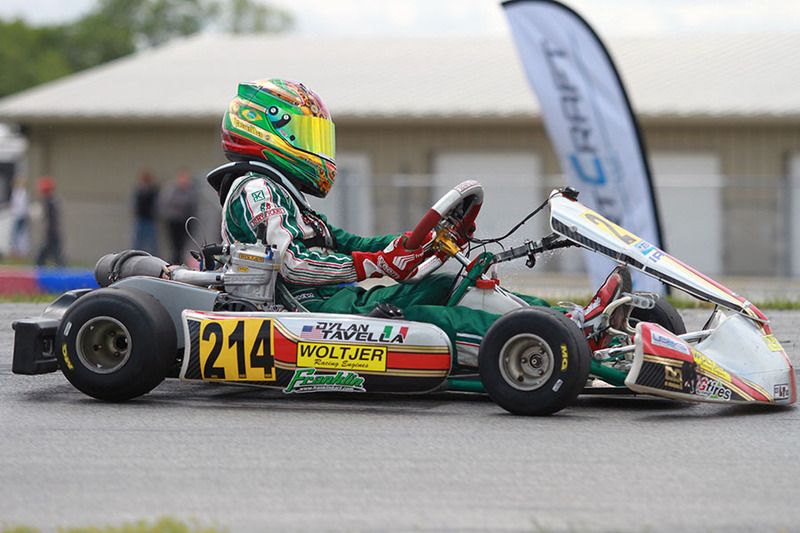 The Junior rookie competed all season long in Europe, finishing fifth at the CIK-FIA OK Junior world championship. A true Junior rookie in the field will be Florida’s Reece Gold. The 2017 SKUSA Pro Tour Mini Swift vice champion is making the move at the SuperNationals, so we will be watching his transition from the Cadet kart to the bigger Junior ride. Others to watch include back-to-back WKA champion Pauly Massimino (Top Kart) and USPKS title winner Maks Kowalski (Franklin / Merlin).